Often planted for its changing, colorful foliage, red barberry (Berberis thunbergii), also called Japanese barberry, is a medium-size deciduous shrub that grows 3 to 5 feet high. 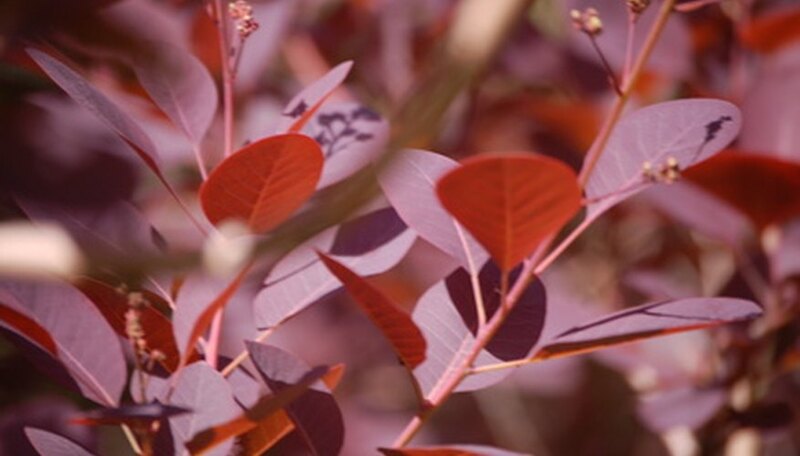 Its leaves are purple during spring and summer, then turn orange, red and yellow in autumn. Tiny, fragrant yellow flowers in spring grow into small, reddish berries that stay on the bush through the winter. Barberry has tiny thorns, or barbs, that are not readily visible until you touch the branches. It is excellent planted as a boundary hedge to keep out small animals. Barberry grows best in full sun and well-drained soil. A common fungal disease that attacks evergreen and deciduous trees and shrubs, anthracnose can appear slightly different on different varieties. On barberry it appears as brownish round spots with reddish margins on the upper surface of the leaves. It also infects young twigs and leaves that are in the uncurling stage of growth. Athracnose is best treated by removing affected parts of the shrub and watering at soil level. Fungal infections are spread primarily when the foliage is wet. Anthracnose does not spread during dry conditions. Found in most gardens, powdery mildew is a fungal infection that appears as a white or gray powder-like growth on leaves, flowers and stems. The leaves may curl and twist before the white powder is visible, with severe infections turning leaves yellowish or brown with the new shoots and flowers disfigured. The best prevention is to space plants far enough apart that air can circulate between them. Hitting the affected plants with a strong spray from a garden hose may help to reduce the infection. To effectively control powdery mildew, follow a regular spraying program as soon as the first signs of the disease are apparent. Use fungicides that are designed for use on powdery mildew and follow the manufacturer's instructions. Rusts consist of a class of several varieties of fungi that infect trees and shrubs such as red barberry. Its symptoms are reddish-orange masses of spores that form on the lower leaf surfaces. The upper face of the leaf turns yellow or brown and usually prematurely drops off the barberry shrub. Control the spread of these fungi by pruning off and destroying infected parts of the plants as soon as they appear. Water from below as fungal diseases are easily spread when foliage is wet.